This is the Itinerary of my amazing trip to the delightful City of Seattle and the most amazing Triple Creek Ranch, Montana. Visit some of USA’s hidden treasures and unique wilderness. I have just experience 2 nights in the cosmopolitan city of Seattle. We experienced the dizzy heights of the Space Needle where we had a delicious lunch in the revolving restaurant. 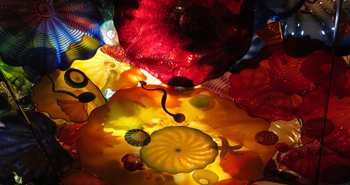 We then walked next door and visited the internationally acclaimed Chihuly Garden and Glass to see the outstanding glass sculptures. 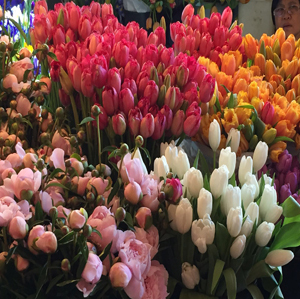 We made a quick visit to the bustling Pike Place Market, where you can buy flowers and every type of fresh fish. We spent to nights in the Palladian Hotel, a quirky Kimpton Hotel, great rooms and delicious breakfast in a fabulous location for exploring the city. The next day we went Whale Watching with Puget Sound Express. 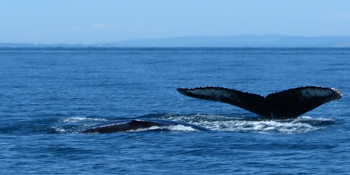 We were looking for a pod of Orcas which we did not find but we actually travelled all the way down to Victoria and found some Humpback Whales. So it was worth the journey just to watch them rolling around in the sea. Back to Seattle where we then took a Seaplane Tour with Kenmore Air. This was a great way to see the whole of the City and surrounding area, a truly memorable experience. 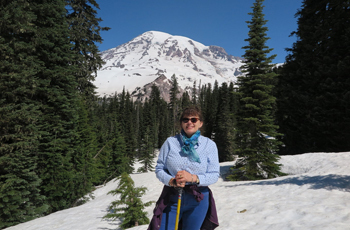 Next day we set off early to go hiking on Mount Rainer, the weather was amazing, bright blue skies with snow on the ground. We set off for a gentle hike in our snow shoes, I think I am better in my high heels though !! 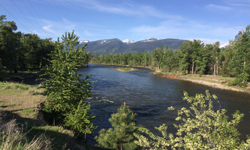 We then flew to Missoula for our 3 night stay at Triple Creek Ranch in Montana, an All Inclusive Relais and Chateaux hideaway. I just fell in love with everything about this property and location. 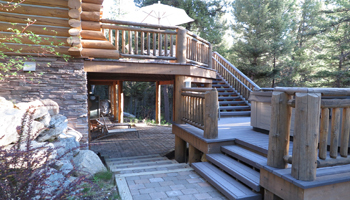 We were accommodated in luxurious log cabins with everything you wish for and things you don’t even know you need until you find it in your room. Hot tubs on the balcony, log fires in your room, a fully stocked bar, room service if you don’t want to travel to the main restaurant in your complimentary golf buggy. The food was to die for, a full range of activities are available and you meet one of the team on arrival and they go over what you want to do and book you in so you don’t miss anything. We went riding through the beautiful woods, across fields all surrounded by the stunning views of Montana. I am a non-rider and it was a great experience as they have horses that are accustomed to novices so at no time did I not feel safe. We went sapphire panning, you can go hiking, on 4×4 expedition, cattle drives, fly fishing the list is endless. The staff were all so friendly and smiling and so keen that you had the best time ever. A great choice for someone who likes to spend time outdoors but stay in the lap of luxury. Sad to leave we flew back to Seattle where we spent out last night at the Crowne Plaza Seattle Airport. This is a lovely hotel with a complimentary shuttle to Westfield Southcenter Mall, so we had a couple of hours of retail therapy.